The CED Fanny Packs, made of durable 600D Polyester fabric, are the ideal way to carry items such as your wallet, keys, loose change, and mobile phone, in addition to your personal handgun! The CED Fanny Packs are designed with three compartments, each having top quality double zippered closures. They can be opened quickly, accessing your handgun, using one hand only, by releasing a "quick-release buckle and pulling it back. Twin head zippers slide open smoothly providing quick retrieval of the stored handgun. 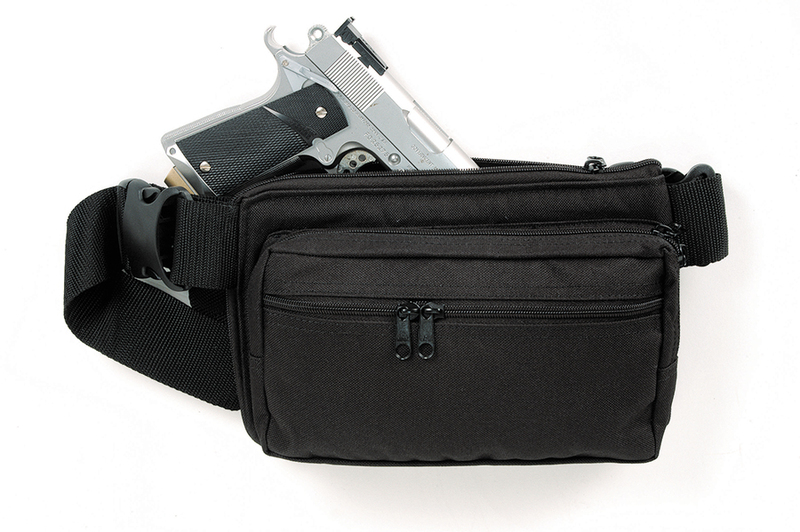 The CED Fanny Packs come in two sizes to easily fit your handgun or body size. Each has a body strap that extends to fit waist lines up to 48" inches. An Extension Strap is available which will provide up to 24" additional inches for more comfort. Available for right hand draw only.